Ingredients: 2 cups Gluten Free flour (I used King Arthur's GF flour ), 1/2 cup raw cane sugar, 1/2 cup packed brown sugar, 3/4 tsp baking soda, 3/4 tsp salt, 1 tsp cinnamon, 1/2 cup coconut milk (or your non-dairy milk choice), 1 TBSP apple cider vinegar (I used Bragg's Apple Cider Vinegar), 3 mashed ripe bananas, 1/4 cup canola oil, 2 TBSP apple sauce, 1 tsp pure vanilla extract and a little Earth Balance Soy-Free Butter for the pan. My recipe is adapted from this one, by a few allergy-free ingredients and measurements. Preheat oven to 350 degrees. 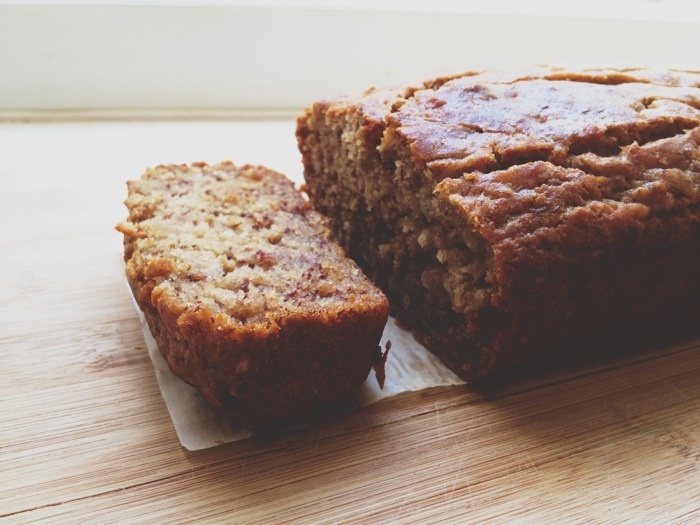 Prepare your pan by using Earth Balance soy-free butter and a strip of parchment paper to line a 9x5in loaf pan. In a medium sized mixing bowl sift and combine all dry ingredients: flour, sugar, brown sugar, baking soda, salt and cinnamon. In a separate bowl whisk the milk and apple cider vinegar together and let sit for 2 minutes. Next add your mashed bananas, oil, applesauce and vanilla into the milk/apple cider vinegar mixture. Stir together until combined. Fold in your dry mixture, careful to not over mix. Pour into loaf pan and bake for 1 hour (or until inserted toothpick in middle of loaf is clean) at 350 degrees. Let rest for 20 minutes before serving.